If the Spring has run dry it's because of the ruthless cruelty of the dictators, not any lack of democratic will or bravery on the part of the protesters. The Bahrain Grand Prix will go ahead this year in October despite huge opposition inside and outside the country. The race was initially called off following the brutal suppression of anti-government protests in the country. The Bahrain government, under king, Hamad bin Isa al-Khalifa, only lifted martial law on Wednesday after 11 weeks, but is still said to be attacking peaceful protesters according to human rights observers. The state is still alleged to be arresting and torturing its people following a series of democratic protests in the wake of the Arab Spring which led to Saudi Arabian troops being called in to suppress the uprisings. “There will be increased repression of human rights if the grand prix is held. To go ahead pretending it’s business as usual is very bad when people continue to be detained and tortured. 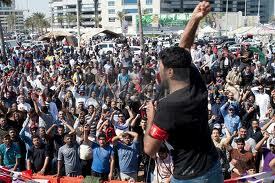 “Formula One’s decision is a kick in the teeth for the Bahraini people. The race will happen in a country where government troops continue to shoot and arrest peaceful protesters. Syrian forces have opened fire on protesters today. At the time of writing reports the death toll to be 27 in the central city of Hama. The BBC writes that “security forces opened fire on a crowd of about 50,000 people” in the city according to activists. “In a pattern seen every Friday since mid-March, protesters have marched out of mosques after noon prayers, to be met by security forces intent on crushing a revolt against (President) Assad, in power in Syria for the last 11 years. Left Foot Forward, earlier this week, reported on the Syrian revolution and the horrific murder of Hamza al-Khatib, who activists say was tortured and mutilated. He has become a symbol for protesters and in Dael, a town near Deraa, “about 5,000 protesters raised pictures of him as they called for freedom and the downfall of the regime”. “But mediation or ceasefire initiatives such as South Africa’s, and others encouraged elsewhere, have something wrong with them: they offer Gaddafi a lifeline at a point when he is facing an increase in defections and significant opposition progress on the battlefield, and when he is becoming increasingly isolated internationally – as shown last week when Russia shifted its position by calling on him to stand down. On the other side of the country, China have made diplomatic contact with rebel forces in a diplomatic set-back for Gaddaffi that follows France having said they are working with those close to the dictator who they believe could convince him to relinquish power. What started out as opposition protests have now tipped Yemen to the brink of civil war today after the country’s President Ali Abdullah Saleh was wounded in a rocket attack on his presidential palace. His injuries are not reported as severe but four guards were killed and seven officials were injured in the attack including prime minister Ali Muhammad Mujawar and his deputy Rashad Al-Alimi alongside the speaker of the country’s parliament. “It was the first time that tribesmen have targeted President Saleh’s palace in nearly two weeks of heavy fighting with government troops in the capital. Their response came after government forces launched an intense artillery barrage at the homes of two tribal leaders and a top military general who also joined the opposition. “The nation is on the brink of civil war after two weeks of fighting between Saleh’s troops and tribesmen loyal to Sheik Sadeq al-Ahmar, head of the Hashid, Yemen’s most powerful tribal confederation. The Arab Spring was a spontaneous wave of democratic uprisings, as surprising as they were inspiring but some have now asked if the Spring has run dry. If it has it’s because of the ruthless cruelty of the dictators and their security forces, not any lack of democratic will or bravery on the part of the protesters. It certainly doesn’t help to have internationally recognisable brands like Formula One appearing to turn a blind eye to the actions of such rulers. The Guardian has mapped out the key events of the Arab Spring in this timeline. Poll: Should the United States pull out of Libya?